I’d like to welcome Luanne Castle to Anneli’s Place today. Luanne is writing a memoir called Scrap, about growing up in the sixties over a bomb shelter and in front of the city dump. 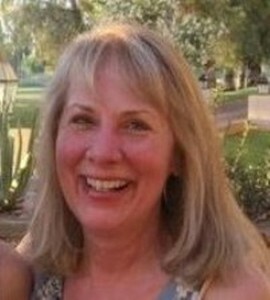 She taught English at California State University, San Bernardino, before moving to Arizona, where she now lives with a herd of javelina. Her creative nonfiction took first place in a contest sponsored by Midlife Collage. Her poetry has been published in The Antigonish Review, The MacGuffin, A Narrow Fellow, 13th Moon, Redheaded Stepchild, and many others. She recently put together her first poetry manuscript, called Doll God. When my grandmother moved out of her duplex and into a nursing home, she gave my father a Victorian crazy quilt which had been stored, wrapped in tissue, in her bottom dresser drawer. In my sixteen years, I’d never seen it before, but was immediately drawn to the warm shades of dark reds and soft golden beiges and tans dramatized by the hint of Yale blue in lush velvets, as well as the intricate and beautiful stitching which linked the irregularly shaped scraps together. Each patch had been embellished with embroidered flowers, animals, hearts, paisley, or was itself a patterned velvet or velour. Grandma framed the quilt with a sedate red gabardine, and it was folded very neatly; still, some of the scraps had begun to show signs of wear. Dad left it lying on the kitchen table when he went out to the garage, and I unfolded the quilt, examining the rectangles, wedges, triangles, squares, circles, angles, strips, and heart and moon shaped pieces. Any one of these scraps might be swept up and thrown away after an afternoon of sewing. A basket of these scraps would look like junk. But here they had been artfully trimmed, arranged, stitched, and embellished to tell an intricate story. 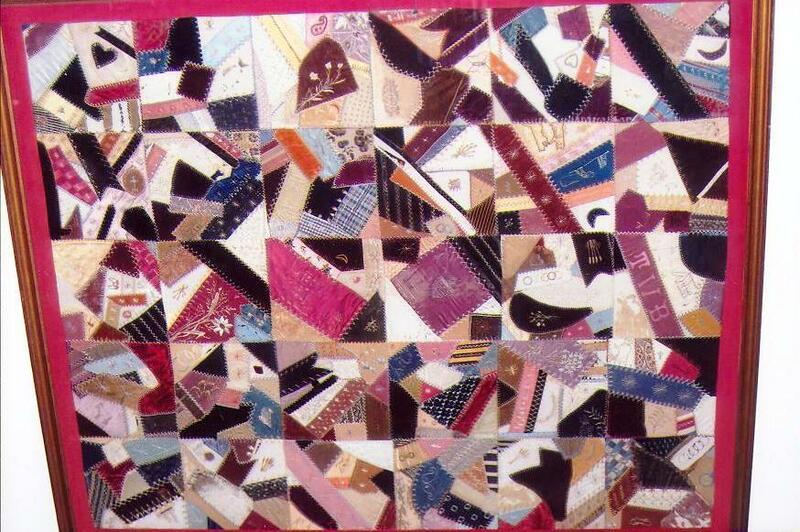 This random patchwork design spoke to me of the past and the intersection of practicality and beauty. When my father came back in, I said, “It’s getting ruined, especially where it’s folded.” My father didn’t seem to understand the value of this old cover, nor did my mother, who walked up the stairs with her laundry basket and said, “Yes, that’s nice.” She arranged the quilt, folded on the back of our living room couch, where it lay for a year. I thought I could see the scraps fading and began to badger my parents to save the quilt. I suspect my father began to agree with me because eventually he took the quilt downtown and had it framed in a painted golden frame under non-glare glass. He hung it on the wall over the couch. In their will, the quilt will be coming to me, as my brother has never shown an interest in it. When I started writing down my memories, they came to me in pieces, much like the irregular and fancy shapes of the velvet scraps. The oldest were faded and threadbare. Sometimes the more I wrote of a memory, the more details that came back to me. Sometimes I would meet a dead end and not be able to find any more to the image or story. These images act as the embroidery on the quilt pieces. I’ve tried to arrest the aging process of my memories by recording them, just as my father had the quilt framed to preserve its condition. As I began to write these fragments of memory, a book about my father and me began to take shape. In honor of my grandmother’s quilt and our linked family story, I’m calling the book Scrap. Do you have any thoughts about Luanne’s post today? Is there an old quilt in your background? What might the maker of the quilt have been thinking about during the many hours it took to sew it? Leave a comment and tell us what you feel?